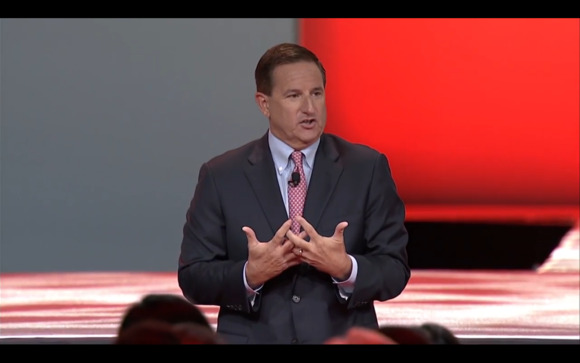 If there was any single take-away message from Oracle co-CEO Mark Hurd at the company's OpenWorld show this week, it was that Oracle has now fully arrived at the cloud party and is ready to lead. Whether that can happen, however, is entirely up to customers -- and their buy-in is far from guaranteed. Oracle made several key additions to its cloud portfolio this week, including new applications for manufacturers. "We now have virtually 100 percent of our portfolio rewritten, rebuilt and modernized for the cloud," Hurd told an audience during his keynote speech on Monday. "We're going to lead a decade-long transition to the cloud." Now, it wants customers to follow. While just 25 percent of production apps today run in the cloud, according to Hurd, a whopping 80 percent of production apps will do so by 2025, he predicted. He also said that virtually all enterprise data will be stored in the cloud by then. There's more than a small share of optimism there. 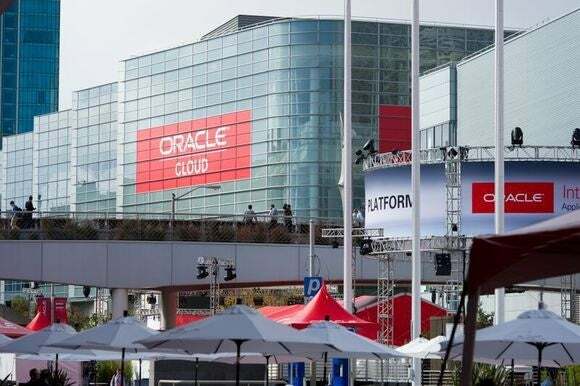 Less than a third of Oracle's existing customers have even started migrating to the cloud, noted Melissa English, president of the Oracle Applications Users Group, in an interview at the show. Oracle logos seen above Oracle Open World in San Francisco on Oct. 26, 2015. Security has always been users' top concern regarding the cloud, but next in line on their collective list of worries has been the question of how quickly they'll have to move from on-premises software to the cloud, English noted, and how long Oracle will continue to support those on-premises offerings. Now that Oracle has announced that it's all-in on the cloud, "I think they're going to start feeling the pressure," she said. Customers are likely to feel the pressure soon: at least one report says the company is motivating its sales force to use aggressive tactics to push accounts to the cloud. Oracle will let customers move at their own pace, Hurd told reporters at a press conference Monday, but his predictions suggest the company envisions a pace that may be quicker than many users have in mind. Hurd has good reason to be in a hurry. Today, valuation of vendors such as Oracle and SAP hinges largely on their cloud growth, noted Holger Mueller, a vice president and principal analyst with Constellation Research. The reality, though, is that the sophisticated enterprise suites that companies have been running on-premises do not yet exist in the cloud, Mueller said. With this week's announcements, "Oracle is close," he said. SAP, meanwhile, "just started officially in January with S/4Hana and is making progress." For now, though, that's "the gating factor," Mueller suggested. "They can say they're ready," but "it's all about getting customers converted." It's Oracle's modus operandi to be bullish about its prospects in a market once it's made the decision to go all-in, said Chris Kanaracus, managing editor and principal analyst at Constellation Research, in an email. "The question, as with anything, is about the execution and how Oracle can show value to customers for its one-stop-shop approach" encompassing software, platform and infrastructure-as-a-service, Kanaracus said. Although Oracle takes pains to emphasize the open-standards underpinnings of its cloud technology, it will have to overcome the perception that customers buying into its full stack could be locked in, he pointed out. Also worth noting on the IaaS front is competition from Amazon Web Services. GE CIO Jim Fowler joined Hurd on-stage at OpenWorld, and "that's quite the coup," Kanaracus noted. "But what went unmentioned was Fowler's appearance a few weeks ago at Amazon Web Services' re:Invent conference." In fact, GE is moving the vast majority of its application workloads to AWS, Kanaracus said. That's "a huge endorsement of AWS, to say the least, and goes to show that customers have mature and viable choices in the market besides Oracle." Oracle was "slow to get cloud religion, but now it’s preaching with all the zeal of a new convert," said Frank Scavo, president of Computer Economics, in an email. It remains to be seen whether new cloud subscriptions will be enough to offset the expected declines in traditional license sales, but "Oracle has tremendous financial resources and domain knowledge to apply to the challenge," he added. "It would be foolish to ever count Oracle out."